The portion sizes of some of Britain's most popular foods are to be cut, with health officials telling the public it is time "to get on a diet". Public Health England is targeting pizzas, ready meals, processed meat and takeaways, in a new obesity drive. The government agency has also urged the food industry to start using healthier ingredients and encourage the public to opt for lower calorie foods. 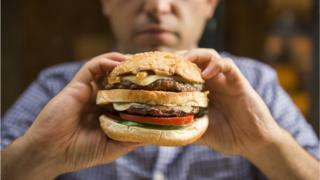 It is all part of a drive to cut calorie consumption by 20% by 2024. The target will apply to 13 different food groups, responsible for a fifth of the calorie intake of children. Combined, these three measures mean health officials are taking direct action to influence the consumption of foods responsible for half of children's calories. "Britain needs to go on a diet. Children and adults routinely eat too many calories, and it's why so many are overweight or obese." If action is not taken, PHE said, it would be prepared to ask the government to legislate. It would be strictly monitoring progress by looking at which products people were buying and would be prepared to "name and shame" individual companies not pulling their weight. The agency is also launching a campaign encouraging adults to consume 400 calories at breakfast and 600 each at lunch and dinner. It is being seen as a rough guide for consumers to follow when they buy meals away from home. A quarter of food is now bought from cafes, restaurants, takeaways or as food-to-go from shops. Media captionSophie said: "Before that app I didn't care how many calories I ate a day"
PHE said major groups such as McDonald's, Subway and Greggs would be promoting foods that kept people within these guidelines. Currently adults consume between 200 and 300 calories more than they should each day. PHE chief nutritionist Dr Alison Tedstone said the 400-600-600 tip would make it easier for "people to make healthier choices" by being able to judge what they should be eating in each sitting. "To get traction on this, the big-selling things need to change," she said. "A few healthy options on the end of a menu won't help solve the nation's obesity problem - we need the regular, everyday products to change." How many calories should we eat? It is recommended that women should eat no more than 2,000 calories a day, while men should limit their intake to 2,500. For children, it varies depending on age. A four-year-old should consume no more than 1,300, while for males aged 17 and 18 it is about 3,000, but overweight and obese children are consuming up to 500 calories more than that. The move has been backed by experts. Prof Russell Viner, of the Royal College of Paediatrics and Child Health, said it was a "bold and necessary" move. He said over the past 40 years there had been a "creep" in portion sizes, with pizzas and hamburgers "simply much bigger than they were in our parents' time". "The availability of fast food at pocket money prices and the advertising of unhealthy food and drinks to children add to the problem," he added. Food and Drink Federation (FDF) boss Ian Wright said it was the right approach and industry was fully supportive. "The FDF and its members take their responsibility in tackling obesity seriously," he said.